If you haven’t had Japanese Cheesecake, you are missing out! 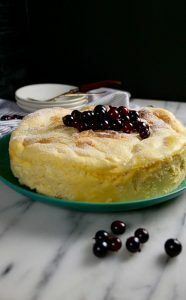 Unlike the traditional New York style cheesecake that is very dense (still delicious in my opinion), the Japanese version is more of a souffle and it is known for its lightness and how it jiggles. There is no graham cracker bottom and the cheesecake gets it light, fluffy texture from the beaten egg whites. The recipe is actually quite straight forward and if you follow it, you will have a successful Japanese cheesecake every time! No need to wait in hour long line ups anymore, just make your own at home! In a double boiler, melt together milk, cream cheese and butter. Set aside and cool. To this mixture, add the flour and corn meal and whisk to get a smooth batter. In a separate bowl or mixer , add all the 6 egg whites and beat on high, add the 1/4 cup sugar gradually until you have firm peaks in the egg whites. Fold the egg whites gently into the first mixture. 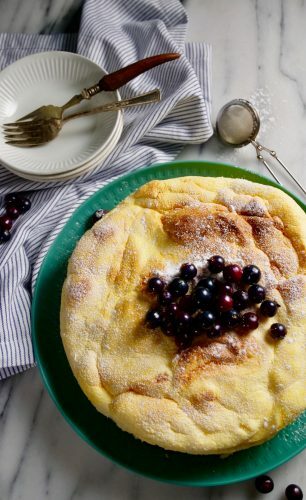 Pour into a round cake pan and bake in a water bath (so you can set up a large turkey roaster with hot water inside and place the round cake pan into it). If you are using a silicone bake pan you don't need to line it. If not, line it with parchment and butter to prevent sticking. I love the idea of making it vs living in Toronto and waiting in line for hours to buy one. It’s probably faster to make than buy!